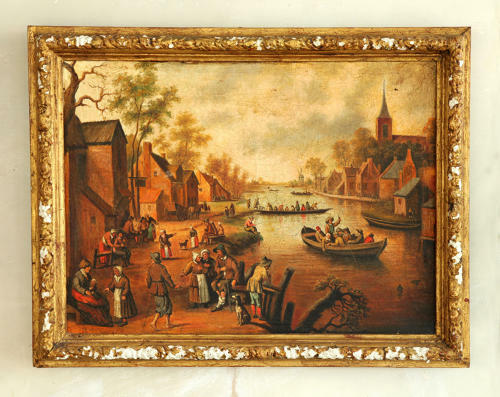 A canal Scene after Pieter Breughel from the studio of Miguel Canals, a Barcelona artist whose reproductions have become admired and collectable in themselves. Canals supervised copies of many Old Masters, often commissioned by owners who wanted the originals kept safe while having the reproductions on the walls of their homes. Elaborate gilt frame with some flaking to edges. please contact fo more information.